What is your favorite thing to do on the weekends? Spend time with my kids and husband, read, sing, nap! What made you decide to choose community college? It was affordable, nearby, and was recommended by several people. Were there any obstacles in your life prior to attending community college that you had to overcome? I was born to a single mother with a disability, and I too suffer from social and generalized anxiety disorder. I also became a mother of three living under the poverty line. I lacked confidence so I never really thought I was smart enough to be successful in college. However through my own experience with social and generalized anxiety I was able to connect to other people with similar issues. I think it has made me more aware of the importance of respect for all types of people. I am still below the poverty line, but now I see a light at the end of the tunnel -- and I have found happiness where I am in life. I lacked confidence and feared failure when at my community college. However, it was through failure that I grew and gained confidence with the help of my mentor. When I transferred, the transition was a bit difficult because I was a junior and yet I was brand new. I soon realized that being outside my comfort zone was exactly where I needed to be and made friends with other students like myself as well as traditional students. What is one of the most important things that helped you succeed in community college and beyond? My mentor, Dr. McCormick. Without her I wouldn't be where I am today both academically and personally. What are you most excited about for your future right now? Graduating next spring! But before that, writing my book College Success for Moms and being able to reach out and help moms who want to succeed in college. What is the best piece of advice you can give our readers who are currently attending community college? Don't give up, don't back down in the face of failure and adversity, rise above your circumstances and beat the odds set against you! Dianna graduated from Mt. San Antonio College in 2013 and currently attends Cal State Fullerton where she'll graduate with a bachelor's in English. 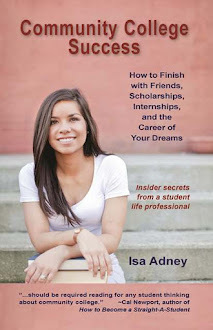 She is currently the Editor-in-Chief of the Pearson Students blog and the founder and writer of CollegeSuccessforMoms.com. 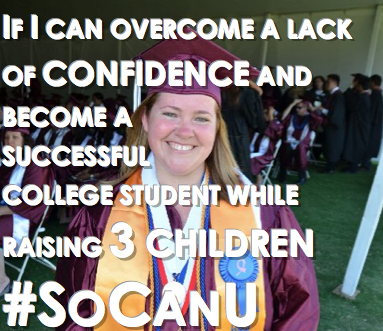 Join the #SoCanU movement here!